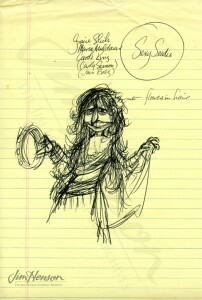 A veritable Who’s Who of popular solo musical artists appeared on The Muppet Show as guest stars. These included Judy Collins, Lou Rawls, Loretta Lynn, Helen Reddy, Crystal Gayle, Arlo Guthrie, and Anne Murray. 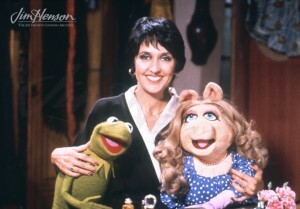 Joan Baez, singer-songwriter and social activist, joined the list at the start of the fifth (and final) season. In a very (very!) loose nod to Baez’s civil rights work, the episode’s action revolves around an effort by a group of rats to infiltrate the show. While concerned more about their access to the refrigerator than their equal rights, the rats do convince Kermit that they should be part of the group, despite being pests, and join in Baez’s performance of “Will The Circle Be Unbroken”. Baez, however, warns Kermit that rather than being downtrodden, the rats were actually trying to take over the show. The closing bears this out when the rats appear dressed as Kermit and Miss Piggy. Joan Baez with Kermit and Miss Piggy on The Muppet Show. 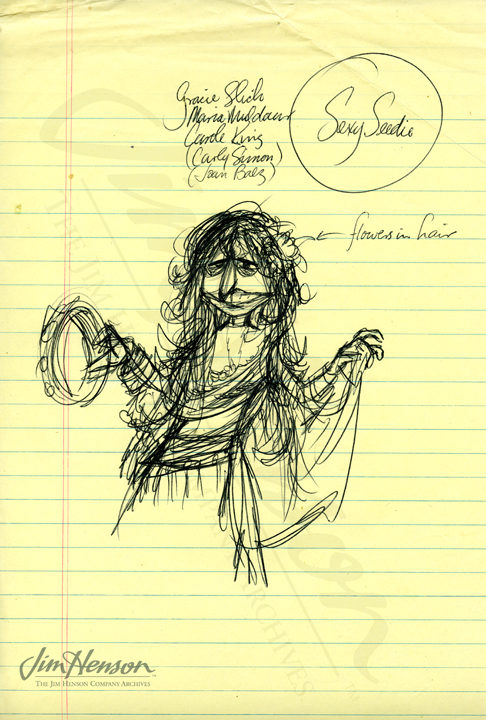 Michael Frith’s design for a folk singer character based on Joan Baez and her contemporaries. This entry was posted in 03-March '80, 1980, Muppet Show and tagged Anne Murray, Arlo Guthrie, Crystal Gayle, Helen Reddy, Joan Baez, Judy Collins, Kermit, Loretta Lynn, Lou Rawls, Miss Piggy. Bookmark the permalink.